This article appears in the Spring 2011 edition of the Intercollegiate Review. See the issue’s Table of Contents here. Nothing could be further from the truth, and even a cursory chronological review makes that clear. In a.d. 632, Egypt, Palestine, Syria, Asia Minor, North Africa, Spain, France, Italy, and the islands of Sicily, Sardinia, and Corsica were all Christian territories. Inside the boundaries of the Roman Empire, which was still fully functional in the eastern Mediterranean, orthodox Christianity was the official, and overwhelmingly majority, religion. Outside those boundaries were other large Christian communities—not necessarily orthodox and Catholic, but still Christian. Most of the Christian population of Persia, for example, was Nestorian. Certainly there were many Christian communities in Arabia. The surviving central secular authority in the Christian world at this time was the East Roman, or Byzantine, Empire. Having lost so much territory in the seventh and eighth centuries to sudden amputation by the Muslims, the Byzantines took a long time to gain the strength to fight back. By the mid-ninth century, they mounted a counterattack on Egypt, the first time since 645 that they had dared to come so far south. Between the 940s and the 970s, the Byzantines made great progress in recovering lost territories. Emperor John Tzimiskes retook much of Syria and part of Palestine, getting as far as Nazareth, but his armies became overextended and he had to end his campaigns by 975 without managing to retake Jerusalem itself. Sharp Muslim counterattacks followed, and the Byzantines barely managed to retain Aleppo and Antioch. The struggle continued unabated into the eleventh century. In 1009, a mentally deranged Muslim ruler destroyed the Church of the Holy Sepulchre in Jerusalem and mounted major persecutions of Christians and Jews. He was soon deposed, and by 1038 the Byzantines had negotiated the right to try to rebuild the structure, but other events were also making life difficult for Christians in the area, especially the displacement of Arab Muslim rulers by Seljuk Turks, who from 1055 on began to take control in the Middle East. This destabilized the territory and introduced new rulers (the Turks) who were not familiar even with the patchwork modus vivendi that had existed between most Arab Muslim rulers and their Christian subjects. Pilgrimages became increasingly difficult and dangerous, and western pilgrims began banding together and carrying weapons to protect themselves as they tried to make their way to Christianity’s holiest sites in Palestine: notable armed pilgrimages occurred in 1064–65 and 1087–91. In the western and central Mediterranean, the balance of power was tipping toward the Christians and away from the Muslims. In 1034, the Pisans sacked a Muslim base in North Africa, finally extending their counterattacks across the Mediterranean. They also mounted counterattacks against Sicily in 1062–63. In 1087, a large-scale allied Italian force sacked Mahdia, in present-day Tunisia, in a campaign jointly sponsored by Pope Victor III and the countess of Tuscany. Clearly the Italian Christians were gaining the upper hand. But while Christian power in the western and central Mediterranean was growing, it was in trouble in the east. The rise of the Muslim Turks had shifted the weight of military power against the Byzantines, who lost considerable ground again in the 1060s. Attempting to head off further incursions in far-eastern Asia Minor in 1071, the Byzantines suffered a devastating defeat at Turkish hands in the battle of Manzikert. As a result of the battle, the Christians lost control of almost all of Asia Minor, with its agricultural resources and military recruiting grounds, and a Muslim sultan set up a capital in Nicaea, site of the creation of the Nicene Creed in a.d. 325 and a scant 125 miles from Constantinople. Desperate, the Byzantines sent appeals for help westward, directing these appeals primarily at the person they saw as the chief western authority: the pope, who, as we have seen, had already been directing Christian resistance to Muslim attacks. In the early 1070s, the pope was Gregory VII, and he immediately began plans to lead an expedition to the Byzantines’ aid. He became enmeshed in conflict with the German emperors, however (what historians call “the Investiture Controversy”), and was ultimately unable to offer meaningful help. Still, the Byzantines persisted in their appeals, and finally, in 1095, Pope Urban II realized Gregory VII’s desire, in what turned into the First Crusade. Whether a crusade was what either Urban or the Byzantines had in mind is a matter of some controversy. But the seamless progression of events which lead to that crusade is not. Far from being unprovoked, then, the crusades actually represent the first great western Christian counterattack against Muslim attacks which had taken place continually from the inception of Islam until the eleventh century, and which continued on thereafter, mostly unabated. Three of Christianity’s five primary episcopal sees (Jerusalem, Antioch, and Alexandria) had been captured in the seventh century; both of the others (Rome and Constantinople) had been attacked in the centuries before the crusades. The latter would be captured in 1453, leaving only one of the five (Rome) in Christian hands by 1500. Rome was again threatened in the sixteenth century. This is not the absence of provocation; rather, it is a deadly and persistent threat, and one which had to be answered by forceful defense if Christendom were to survive. The crusades were simply one tool in the defensive options exercised by Christians. Again, not true. One version of Pope Urban II’s speech at Clermont in 1095 urging French warriors to embark on what would become known as the First Crusade does note that they might “make spoil of [the enemy’s] treasures,”8 but this was no more than an observation on the usual way of financing war in ancient and medieval society. And Fulcher of Chartres did write in the early twelfth century that those who had been poor in the West had become rich in the East as a result of their efforts on the First Crusade, obviously suggesting that others might do likewise.9 But Fulcher’s statement has to be read in its context, which was a chronic and eventually fatal shortage of manpower for the defense of the crusader states. Fulcher was not being entirely deceitful when he pointed out that one might become rich as a result of crusading. But he was not being entirely straightforward either, because for most participants, crusading was ruinously expensive. One of the chief reasons for the foundering of the Fourth Crusade, and its diversion to Constantinople, was the fact that it ran out of money before it had gotten properly started, and was so indebted to the Venetians that it found itself unable to keep control of its own destiny. Louis IX’s Seventh Crusade in the mid-thirteenth century cost more than six times the annual revenue of the crown. The popes resorted to ever more desperate ploys to raise money to finance crusades, from instituting the first income tax in the early thirteenth century to making a series of adjustments in the way that indulgences were handled that eventually led to the abuses condemned by Martin Luther. Even by the thirteenth century, most crusade planners assumed that it would be impossible to attract enough volunteers to make a crusade possible, and crusading became the province of kings and popes, losing its original popular character. When the Hospitaller Master Fulk of Villaret wrote a crusade memo to Pope Clement V in about 1305, he noted that “it would be a good idea if the lord pope took steps enabling him to assemble a great treasure, without which such a passage [crusade] would be impossible.”12 A few years later, Marino Sanudo estimated that it would cost five million florins over two years to effect the conquest of Egypt. Although he did not say so, and may not have realized it, the sums necessary simply made the goal impossible to achieve. By this time, most responsible officials in the West had come to the same conclusion, which explains why fewer and fewer crusades were launched from the fourteenth century on. This has been a very popular argument, at least from Voltaire on. It seems credible and even compelling to modern people, steeped as they are in materialist worldviews. And certainly there were cynics and hypocrites in the Middle Ages—beneath the obvious differences of technology and material culture, medieval people were just as human as we are, and subject to the same failings. However, like the first two myths, this statement is generally untrue, and demonstrably so. For one thing, the casualty rates on the crusades were usually very high, and many if not most crusaders left expecting not to return. At least one military historian has estimated the casualty rate for the First Crusade at an appalling 75 percent, for example.14 The statement of the thirteenth-century crusader Robert of Crésèques, that he had “come from across the sea in order to die for God in the Holy Land”15—which was quickly followed by his death in battle against overwhelming odds—may have been unusual in its force and swift fulfillment, but it was not an atypical attitude. It is hard to imagine a more conclusive way of proving one’s dedication to a cause than sacrificing one’s life for it, and very large numbers of crusaders did just that. But this assertion is also revealed to be false when we consider the way in which the crusades were preached. Crusaders were not drafted. Participation was voluntary, and participants had to be persuaded to go. The primary means of persuasion was the crusade sermon, and one might expect to find these sermons representing crusading as profoundly appealing. So why did the preaching work? It worked because crusading was appealing precisely because it was a known and significant hardship, and because undertaking a crusade with the right motives was understood as an acceptable penance for sin. Far from being a materialistic enterprise, crusading was impractical in worldly terms, but valuable for one’s soul. There is no space here to explore the doctrine of penance as it developed in the late antique and medieval worlds, but suffice it to say that the willing acceptance of difficulty and suffering was viewed as a useful way to purify one’s soul (and still is, in Catholic doctrine today). Crusading was the near-supreme example of such difficult suffering, and so was an ideal and very thorough-going penance. As difficult as it may be for modern people to believe, the evidence strongly suggests that most crusaders were motivated by a desire to please God, expiate their sins, and put their lives at the service of their “neighbors,” understood in the Christian sense. Part of the answer to this myth may be found above, under Myth #1. Muslims had been attacking Christians for more than 450 years before Pope Urban declared the First Crusade. They needed no incentive to continue doing so. But there is a more complicated answer here, as well. Nor had there been an immediate reaction to the crusades among Muslims. As Carole Hillenbrand has noted, “The Muslim response to the coming of the Crusades was initially one of apathy, compromise and preoccupation with internal problems.”22 By the 1130s, a Muslim counter-crusade did begin, under the leadership of the ferocious Zengi of Mosul. But it had taken some decades for the Muslim world to become concerned about Jerusalem, which is usually held in higher esteem by Muslims when it is not held by them than when it is. Action against the crusaders was often subsequently pursued as a means of uniting the Muslim world behind various aspiring conquerors, until 1291, when the Christians were expelled from the Syrian mainland. And—surprisingly to Westerners—it was not Saladin who was revered by Muslims as the great anti-Christian leader. That place of honor usually went to the more bloodthirsty, and more successful, Zengi and Baibars, or to the more public-spirited Nur al-Din. The first Muslim crusade history did not appear until 1899. By that time, the Muslim world was rediscovering the crusades—but it was rediscovering them with a twist learned from Westerners. In the modern period, there were two main European schools of thought about the crusades. One school, epitomized by people like Voltaire, Gibbon, and Sir Walter Scott, and in the twentieth century Sir Steven Runciman, saw the crusaders as crude, greedy, aggressive barbarians who attacked civilized, peace-loving Muslims to improve their own lot. The other school, more romantic and epitomized by lesser-known figures such as the French writer Joseph-François Michaud, saw the crusades as a glorious episode in a long-standing struggle in which Christian chivalry had driven back Muslim hordes. In addition, Western imperialists began to view the crusaders as predecessors, adapting their activities in a secularized way that the original crusaders would not have recognized or found very congenial. At the same time, nationalism began to take root in the Muslim world. Arab nationalists borrowed the idea of a long-standing European campaign against them from the former European school of thought—missing the fact that this was a serious mischaracterization of the crusades—and using this distorted understanding as a way to generate support for their own agendas. This remained the case until the mid-twentieth century, when, in Riley-Smith’s words, “a renewed and militant Pan-Islamism” applied the more narrow goals of the Arab nationalists to a worldwide revival of what was then called Islamic fundamentalism and is now sometimes referred to, a bit clumsily, as jihadism.23 This led rather seamlessly to the rise of Osama bin Laden and al-Qaeda, offering a view of the crusades so bizarre as to allow bin Laden to consider all Jews to be crusaders and the crusades to be a permanent and continuous feature of the West’s response to Islam. Let us return to President Clinton’s Georgetown speech. How much of his reference to the First Crusade was accurate? It is true that many Muslims who had surrendered and taken refuge under the banners of several of the crusader lords—an act which should have granted them quarter—were massacred by out-of-control troops. This was apparently an act of indiscipline, and the crusader lords in question are generally reported as having been extremely angry about it, since they knew it reflected badly on them.24 To imply—or plainly state—that this was an act desired by the entire crusader force, or that it was integral to crusading, is misleading at best. In any case, John France has put it well: “This notorious event should not be exaggerated. . . . However horrible the massacre . . . it was not far beyond what common practice of the day meted out to any place which resisted.”25 And given space, one could append a long and bloody list, stretching back to the seventh century, of similar actions where Muslims were the aggressors and Christians the victims. Such a list would not, however, have served Mr. Clinton’s purposes. Mr. Clinton was probably using Raymond of Aguilers when he referred to “blood running up to [the] knees” of crusaders.26 But the physics of such a claim are impossible, as should be apparent. Raymond was plainly both bragging and also invoking the imagery of the Old Testament and the Book of Revelation.27 He was not offering a factual account, and probably did not intend the statement to be taken as such. As for whether or not we are “still paying for it,” see Myth #4, above. This is the most serious misstatement of the whole passage. What we are paying for is not the First Crusade, but western distortions of the crusades in the nineteenth century which were taught to, and taken up by, an insufficiently critical Muslim world. The problems with Mr. Clinton’s remarks indicate the pitfalls that await those who would attempt to explicate ancient or medieval texts without adequate historical awareness, and they illustrate very well what happens when one sets out to pick through the historical record for bits—distorted or merely selectively presented—which support one’s current political agenda. This sort of abuse of history has been distressingly familiar where the crusades are concerned. But nothing is served by distorting the past for our own purposes. Or rather: a great many things may be served . . . but not the truth. Distortions and misrepresentations of the crusades will not help us understand the challenge posed to the West by a militant and resurgent Islam, and failure to understand that challenge could prove deadly. Indeed, it already has. It may take a very long time to set the record straight about the crusades. It is long past time to begin the task. 1. Warren Hollister, J. Sears McGee, and Gale Stokes, The West Transformed: A History of Western Civilization, vol. 1 (New York: Cengage/Wadsworth, 2000), 311. 2. R. Scott Peoples, Crusade of Kings (Rockville, MD: Wildside, 2009), 7. 4. The Crusades: Campaign Sourcebook, ed. Allen Varney (Lake Geneva, WI: TSR, 1994), 2. 5. Sir Steven Runciman, A History of the Crusades: Vol. III, The Kingdom of Acre and the Later Crusades (Cambridge: Cambridge University Press, 1954), 480. 6. Francesco Gabrieli, The Arabs: A Compact History, trans. Salvator Attanasio (New York: Hawthorn Books, 1963), 47. 7. Reynald of Châtillon’s abortive expedition into the Red Sea, in 1182–83, cannot be counted, as it was plainly a geopolitical move designed to threaten Saladin’s claim to be the protector of all Islam, and just as plainly had no hope of reaching either city. 8. “The Version of Baldric of Dol,” in The First Crusade: The Chronicle of Fulcher of Chartres and other source materials, 2nd ed., ed. Edward Peters (Philadelphia: University of Pennsylvania Press, 1998), 32. 10. Fred Cazel, “Financing the Crusades,” in A History of the Crusades, ed. Kenneth Setton, vol. 6 (Madison, WI: University of Wisconsin Press, 1989), 117. 11. John Porteous, “Crusade Coinage with Greek or Latin Inscriptions,” in A History of the Crusades, 354. 12. “A memorandum by Fulk of Villaret, master of the Hospitallers, on the crusade to regain the Holy Land, c. 1305,” in Documents on the Later Crusades, 1274–1580, ed. and trans. Norman Housley (New York: St. Martin’s Press, 1996), 42. 13. Norman Housley, “Costing the Crusade: Budgeting for Crusading Activity in the Fourteenth Century,” in The Experience of Crusading, ed. Marcus Bull and Norman Housley, vol. 1 (Cambridge: Cambridge University Press, 2003), 59. 14. John France, Victory in the East: A Military History of the First Crusade (Cambridge: Cambridge University Press, 1994), 142. Not all historians agree; Jonathan Riley-Smith thinks it was probably lower, though he does not indicate just how much lower. See Riley-Smith, “Casualties and Knights on the First Crusade,” Crusades 1 (2002), 17–19, suggesting casualties of perhaps 34 percent, higher than those of the Wehrmacht in World War II, which were themselves very high at about 30 percent. By comparison, American losses in World War II in the three major service branches ranged between about 1.5 percent and 3.66 percent. 15. The ‘Templar of Tyre’: Part III of the ‘Deeds of the Cypriots,’ trans. Paul F. Crawford (Burlington, VT: Ashgate, 2003), §351, 54. 16. Jonathan Riley-Smith, The Crusades, Christianity, and Islam (New York: Columbia University Press, 2008), 36. 18. Jonathan Riley-Smith, “Crusading as an Act of Love,” History 65 (1980), 191–92. 19. Letter from T. E. Lawrence to Robert Graves, 28 June 1927, in Robert Graves and B. H. Liddell-Hart, T. E. Lawrence to His Biographers (Garden City, NY: Doubleday, 1938), 52, note. 20. Riley-Smith, The Crusades, Christianity, and Islam, 71. 21. Jonathan Riley-Smith, “Islam and the Crusades in History,” Crusades 2 (2003), 161. 22. Carole Hillenbrand, The Crusades: Islamic Perspectives, (New York: Routledge, 2000), 20. 23. Riley-Smith, Crusading, Christianity, and Islam, 73. 24. There is some disagreement in the primary sources on the question of who was responsible for the deaths of these refugees; the crusaders knew that a large Egyptian army was on its way to attack them, and there does seem to have been a military decision a day or two later that they simply could not risk leaving potential enemies alive. On the question of the massacre, see Benjamin Kedar, “The Jerusalem Massacre of July 1099 in the Western Historiography of the Crusades,” Crusades 3 (2004), 15–75. 25. France, Victory in the East, 355–56. 26. Raymond of Aguilers, in August C. Krey, The First Crusade: The Accounts of Eye-witnesses and Participants (Princeton: Princeton University Press, 1921), 262. 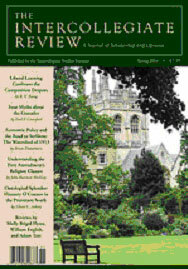 With acknowledgement to INTERCOLLEGIATE REVIEW 21 April 2011.